In the past, I have written about how to make your own waterproof matches, how to create a fire kit and other fire related blogs but………..I have never wrote one on how to extend the life of the match. Well, it really is not extending the life of the match instead it is more like extending the life of the flame. Below are simple instructions for making this camping staple. Ok, I know now you are going, why do I need to extend the life of the flame. Well, let me tell you a story. Consider this situation, you are in the woods primitive camping and it has been misting rain and snow all day. You know that fine mist that slowly gets everything wet but not dripping wet just damp. Well, you have gathered your tinder from your bag or the ground. Fluffed everything up and you strike a match. You see, you have been out for a month and have a limited amount of matches. You did pack other means by which to light a fire but a spark from a flint and steal is not going to get it. What you really need is a concentrated flame on your tinder. This is where the extended flame match comes into play. Having a match that will hold a flame a bit longer than a few seconds can mean the difference between a warm night’s sleep or a shivering ball of misery. These matches are so easy to make, it is a good idea to carry several with you. No, you do not need to use these every time you go to light a fire but for those damp, hard to light campfires having a match with an extended flame life is invaluable. Below are the simple instructions to make your own extended flame life matches. When it comes to the list of supplies you will need there are very few. First, you will need a box of matches not a book of matches. The stem on the matches in a book are not strong enough to hold the next item on the supply list and that is dental floss. Yes, I said dental floss. Why dental floss? Well, first the fact is that dental floss is string. Second, if you get the waxed covered then you have essentially a wick and a very small candle. The last item is optional since your dental floss has a cutting edge but if yours is broke then pick up a pair of scissors. Now that you have all your supplies together, simply pull off a long string of the dental floss and wrap it around the match below the match head. Do not worry about whether or not it will catch. If you have every struck a match, you know that this is not a problem. 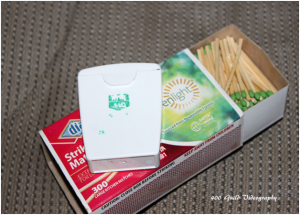 Once you have several matches done, you can simply put them back in the box or in a waterproof container of your choice. With this simple project, you have now created a match that will stay lit so that your tinder has a chance to light even in trying times.